Few wine books can be called classic but the first edition of The World Atlas of Wine made publishing history when it appeared in 1971. It is recognized by critics as the most essential and authoritative wine reference work available. This seventh edition will bring readers, both old and new, bang up to date with the world of wine. Much has changed since the last edition of the Atlas in 2007. Changes in climate, in winemaking technique, in fashion, and in where wine is grown over the past years are all reflected in this new edition. The move away from more predictable international grapes and towards less familiar, local varieties is a noticeable trend. Wine that expresses its precise location is once more to the fore, meaning that an Atlas that allows the reader to understand a region's geography is more necessary than ever. The increasing importance of cooler-climate regions as the effects of climate change become more apparent and the growth of China, not just as a consumer of wine but also as a grape-grower and wine producer, are just two of the many other developments covered. forces to create a classic that no wine lover can afford to be without. Hugh Johnson has led the world of wine writing in new directions over the 40 years since his first book, Wine, was published. 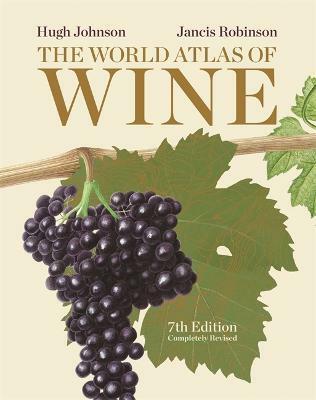 The World Atlas of Wine, his Wine Companion (now in its sixth edition), the annual Pocket Wine Book (since 1977), The Story of Wine, and his memoirs, A Life Uncorked, have all been best-sellers. Indeed, his Pocket Wine is the world's best-selling annual wine book. In 2007, Hugh was awarded an OBE for services to winemaking. Jancis Robinson's award-winning books Vines, Grapes and Wine (1986), the hugely successful Oxford Companion to Wine (1994, 1999, 2006) and Wine Grapes (2012) are landmarks in wine literature. Jancis is the Financial Times wine correspondent and her award-winning website, www.jancisrobinson.com, has subscribers in 100 countries. Jancis was the first person outside the wine trade to qualify as a Master of Wine, in 1984. She was awarded an OBE in 2003 and the Officier de l'Ordre du Merite Agricole in 2010 by the French Minister of Agriculture.